In many areas across the globe, populations live close to major roads and highways and are thus exposed to tailpipe emissions from vehicle traffic, non-tailpipe emissions (such as brake and tire wear), and noise that may have adverse effects on their health and well-being. In 2010, HEI published a critical review of the literature on how exposure to pollutants emitted from cars and trucks may affect human health. 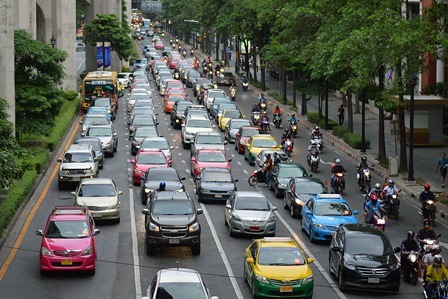 Questions have been generated by the complex findings of the many studies evaluating the health of people who live at various distances from roads or who spend time in traffic. In particular, there is controversy about whether the measurements and surrogate indicators of exposure to air pollution from traffic are valid and whether the studies account adequately for potential confounding factors (such as noise, stress, and socioeconomic characteristics) that may adversely affect health. In the spring of 2018, HEI formed an Expert Panel to update the 2010 critical review; publication is aimed for the end of 2020. More information on the Panel and the aim of the updated review is provided here. Initiating a new research program on traffic-related air pollution, HEI funded 5 studies to improve exposure assessment to traffic-related air pollutants, and 2 additional studies of non-tailpipe emissions (such as brake and tire wear) in tunnels and near roadways. Three studies have been completed (Barratt et al 2018; Sarnat et al 2018; Seto et al unpublished report). The remaining studies are ongoing or have entered HEI's rigorous peer-review process, see the list provided below (Batterman, Frey, Koutrakis, and Wang). Following Request for Applications 17-1, Assessing Adverse Health Effects of Exposure to Traffic-Related Air Pollution, Noise, and Their Interactions With Socio-Economic Status, HEI has funded three additional studies of health outcomes in populations living close to major roadways, see the list below (Dadvand/Sunyer, Fraklin, and Raaschou-Nielsen).